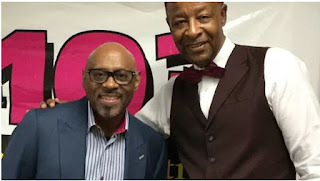 On Sunday Morning Praise, our special guest was the one and only Bishop Paul S. Morton. He came on the show to talk about his new album, “Legacy,” which features his new hit single, “Watching Over Me.” Not only did he come on the show to talk about his new project, but he also had a big announcement to make. The Bishop says “Legacy” will be his last album. Now before you get upset, Bishop Paul Morton is not giving up music completely. He plans on featuring on other albums with different artist. However, this C.D. will be his last solo project, and he plans on moving on to other ventures.